Just got to love a duck. Just got to love going back and looking at old drafts, and discovering posts that were completed but were never… posted. This one is a few years old. So, no summary above the recipe about timing or such. And an older format for posting. But if you enjoy duck… enjoy! After trying with a kitchen knife to dismember this bird (neck removal for the future soup or stock — haven’t decided yet but am leaning towards soup…), and finally succeeding, I succumbed to kitchen tool lust, and bought myself kitchen shears. I may be downsizing a lot of my belongings, but I’m not including the kitchen in on this. Kitchen shears for poultry are SOOOOO worth it! A good knife is fine for chicken, but duck seems to require the extra mile. The neck, upper torso, wings and the heart are in the freezer awaiting said future soup or stock. I used the shears to help me break off the lower part of the bird — and separate the two legs from that lower section of back that contains The Part That Went Over the Fence Last. All three of these parts were used in the below recipe. But they cook faster if separated. I’m going to be diving into my Indian seasonings for this recipe, although I don’t think duck is really a part of Indian cuisine, at least naturally. Fusion foods… Gotta love ’em! THIS feller stayed purple. Unlike my kohlrabi from earlier that week. I’d normally roast veggies at 425 F, but 1) the duck is going to cook at a lower temp, and 2) it is already way way way too hot in here. At 425, the cauliflower should take 40-45 minutes to roast. It will take longer with the lower temp. 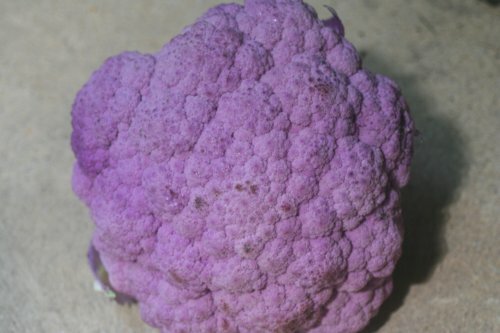 1 cauliflower, de-stemmed, de-leafed, broken up. Mix all of the above together by hand, and set into a 325 degree F oven. Roast for about an hour or 65 minutes. Time in the duck, below, accordingly. One thing about duck is that the breast and the legs/back cook differently. This is true of other poultry but in the duck I prefer to pander to those needs, and will cook them separately. I am, however, sparing you the reading of separate recipes for each duck leg… it’s a time my life gets a move on. I’m cooking them together, along with that bit of back. Score the skin so that fat drips out as the meat cooks. Place in baking pan (not the same one with the cauliflower — we are not interested in having the veggie soak in the fat, thank you), skin side up. Roast for 50 minutes. 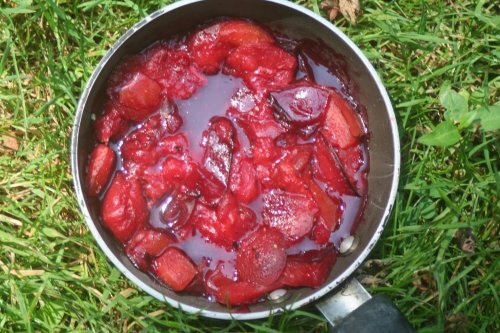 At about the 40-45 minute mark, start simmering your plums in their own juice, in a small stovetop skillet. Add a little ground pepper, nothing else. A lot of commercial outlets love adding sugar to things — plums are sweet enough on their own. DON’T!!! Remove duck from oven and let rest for five minutes (transfer pieces to a clean plate so they don’t soak in their own fat. They will probably drizzle out more, here. If your bird is a good quality free range bird, reserve the fat (you can freeze it). If it is not, that’s where the pesticides lurk, in the fat). 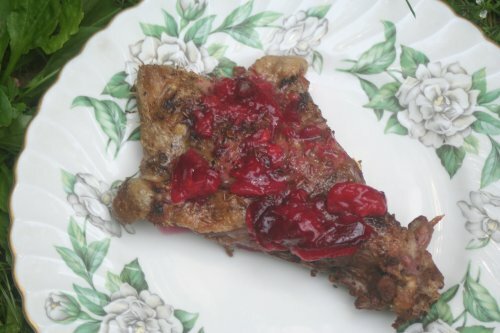 Plate: Put the cauliflower down and layer the duck over or next to the cauliflower, then drizzle the plum over the duck. Enjoy. I am doing this meal as three lunches for one person. Eating the back section today (written Saturday) for lunch with some of the cauliflower, although the photo doesn’t depict the cauliflower there, and taking the legs to work for two separate lunches. A general leafy-green salad would make a good side (in addition to the cauliflower, of course). Actually. leftover cole slaw — see a neighboring recipe — is going to accompany the duck and cauliflower. I did eat this with some of the cauliflower. My immediate lunch that day. If you are following along, this one duck, at 4 pounds something, has provided so far for meat for five meals plus one appetizer, for one person. This isn’t counting the soup or stock, which I expect to go for two more meals, whenever it gets cool and dry enough to get about the work of making the soup. Or the stock. This post is hanging out at Fiesta Friday, where it will extend Friday into a week-long occurrence. Drop on by! Indeed, later this week you can vote for your fave recipes there. Also hanging out at What’s for Dinner, #158, where yet more recipes are around to titillate your fancy, and kick your (duck) legs up over. Drop on by! 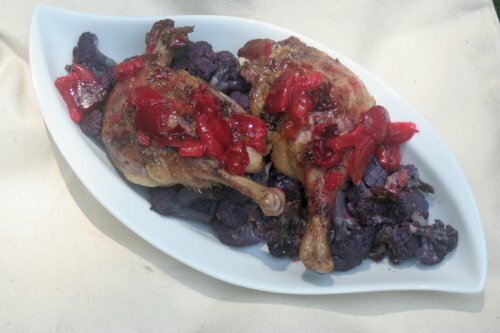 This entry was posted in Cooking, Poultry and tagged Cauliflower, Duck, Duck legs, Paleo, Plum sauce, Plums, Recipe, Whole 30. Bookmark the permalink. just looking at the pics is making me GREEDY !! I need to find some locally farmed duck again! Sooo good, and that’s just the duck itself.